We kept hearing about a new gallery project with the strange name of LETH, and when we probed we were pleased to discover that it's the enterprise of Penzance Post personality, Sam Bassett. 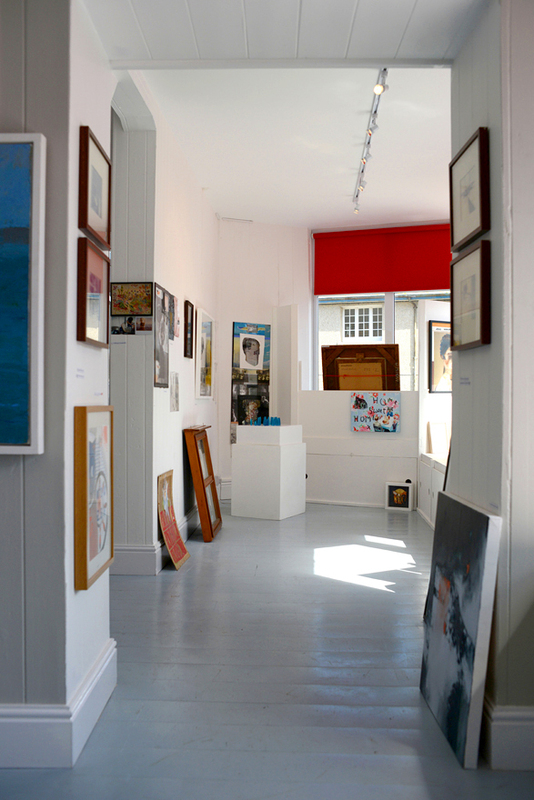 The project currently known as 'Leth' (Cornish for 'milk') is housed in two previously unused Newlyn premises: the rooms above the charity shop on Jack Lane, and the gallery space on Badcock's Block. The former acts as the office and is referred to as 'Leth Office', and latter is used as the main public gallery and is, as yet, untitled. 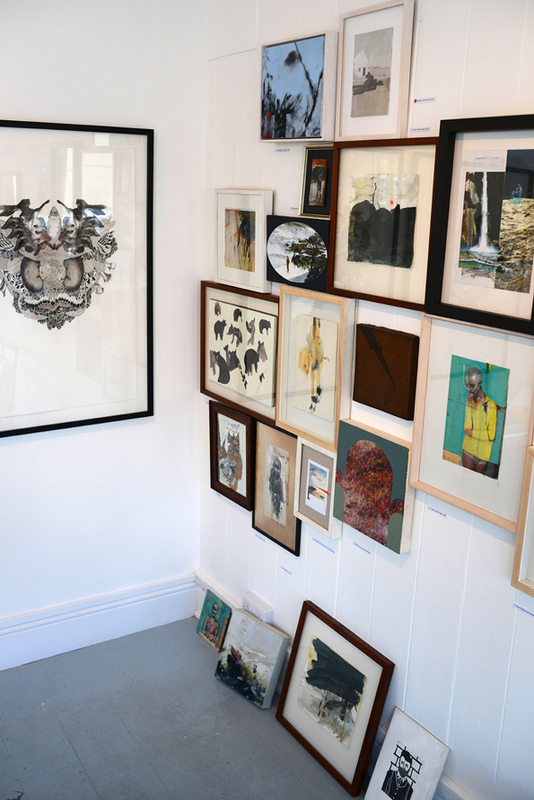 Penzance and Newlyn are hardly short of art galleries, but this is special because it's independent, and because it's run by a working artist rather than a businessperson or committee. As Sam reveals his motives and plans, he convinces us that his mission to showcase new and unrepresented local contemporary artists is pure, but that it's also about having fun. It's this tangible irreverence that makes it feel like an underground project, but at the same time, because of the high-profile gallery space, it comes across as entirely professional in its outlook. The gallery was launched to coincide with the Newlyn Fish Festival and the buzz surrounding it was audible. On the day, Leth Office was also opened up to let us watch Alex Higglet and Georgina Hounsome making festival-related screenprints and Mat McIvor muralising. Newlyn needs this. The main Newlyn Gallery is an excellent focal point, but it's shows are few and long, and it's artists are normally well-established and rarely local. Sam's project feels fresh and relevant; the current summer show is a deliciously discordant but joyous chorus of artistic voices and, in the main, the artists are based in Newlyn and Penzance or are working in this county. One of Sam's goals is to exhibit the best work from the colleges, as a way of crystalising the ambition of local students to follow the call of fine art as a realistic career. We were also interested to learn that Sam is collaborating with another one of our featured persons, Henry Garfit, the founder of the Newlyn School of Art. Sam's vision and boundless drive is unquestioned, but Henry has already set up two successful art institutions and his experience will undoubtedly bring much credibility to this new venture. It transpires that the Stevenson empire is involved too, being the landlords of the premises. In fact, one room of the gallery will be home to their exhibition of Newlyn's fishing heritage, which Sam will help curate by making it more of a interactive affair, with artists using the archive materials as inspiration for new works. Overall then, rather than an exciting flash in the pan, this project looks set to become part of the fabric of the community – intrinsically tied to Newlyn's past and future.